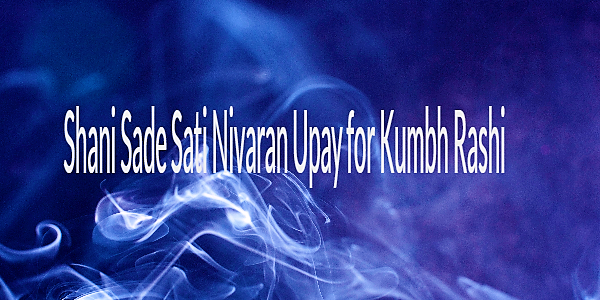 Shani Sadi Sati Nivaran Upay for the Janma Rashi of Kumbh or the Moon Sign of Aquarius has been described by me in this post. This paranormal remedy to off-set and get relief from the malefic side-effects of this astrological phase of Saturn, involves worship of Shiv Bhagwan and the Shivling. The Totka should be useful to the natives of the Moon Sign Aquarius who are undergoing the turbulent and trying times of the Sade Sati of Shani. 1] Start this Shani Sade Sati Nivaran Upay on Somwar[Monday] and continue it until the next Monday. This is an 8 day Upay. 2] During this Monday to Monday period, you have to have a bath and go early in the morning to a Shivalaya and offer a Diya of Pure Ghee to the Shivling and perform 21 Parikrama of the Shivling. 3] Then, after completing the Parikrama, you have to take Ganga Jal in your hands and pour it over the Shivling and then pray to Shiv Bhagwan for Shanti during the period of the Shani Sade Sati, which has affected you. The Parikrama is clockwise around the Shivling, It also depends upon the temple, sometimes there is no space around the Shivling. if unsure follow the other devotees doing the Parikrama. The remedy can be started anytime and it is sufficient for the full period or for debilated Shani.